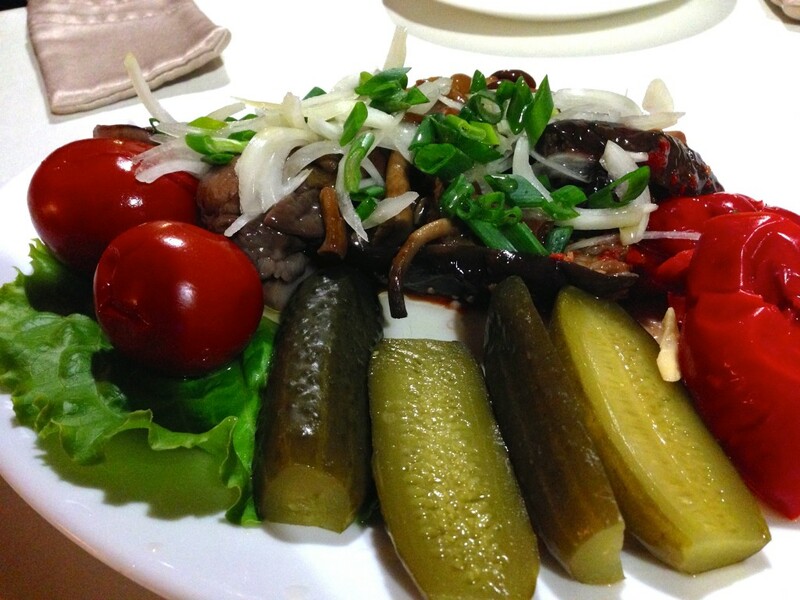 In downtown Donetsk, there are many restaurants that attempt to be all things to all people. Like Tequila Sushi Boom Boom (a Mexican-Sushi fusion joint), Mafia! (a hybrid pizza, sushi, and French restaurant that gives you a free shot of limoncello to start your meal), and Taba$co Country Cooking (actually, I have no idea what this is). Avoid these places, fellow journalists. 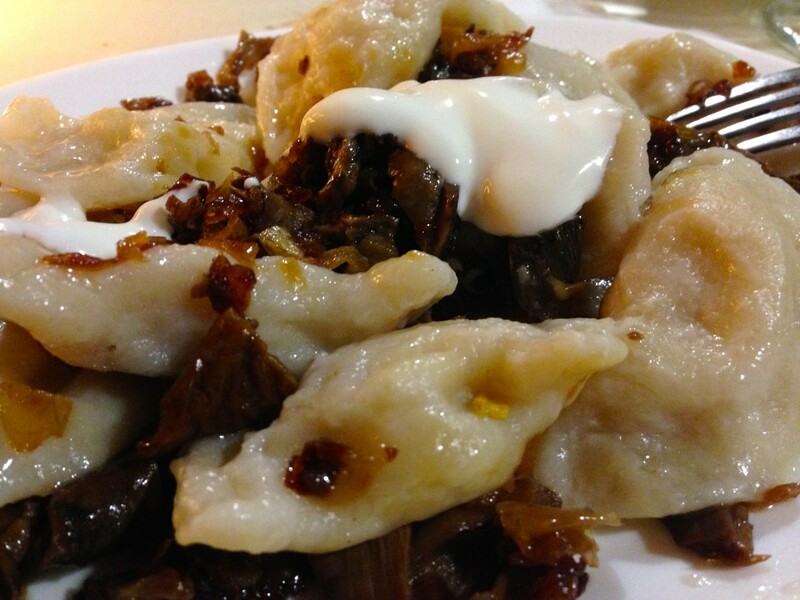 Focus on what Ukraine is known for: hearty, homey dishes that’ll stick to your ribs. The Goose & Swan (pronounced Gusi Lebedi in Russian) will treat you right. 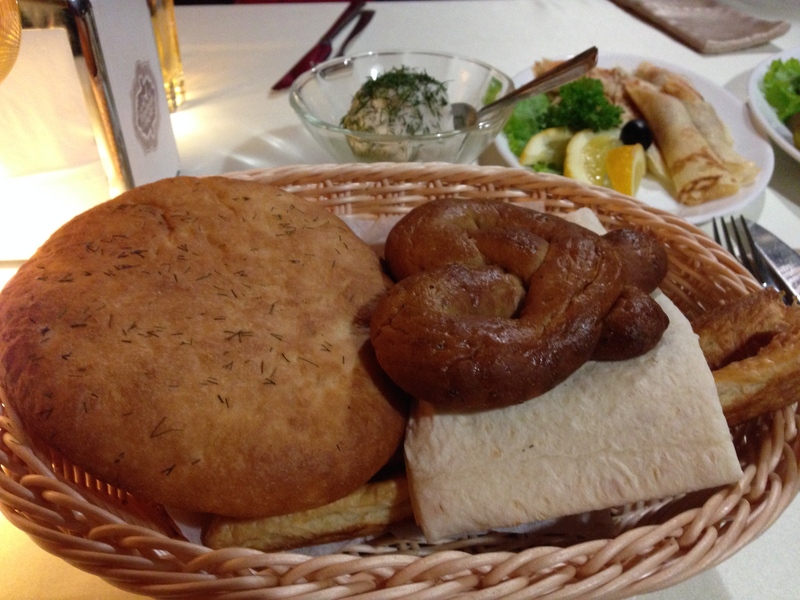 They’ve got all the old favorites (borscht, mushroom soup, vareniki (dumplings), chicken Kiev, etc) and you can eat like a tsar for under $20 a person, including drinks. 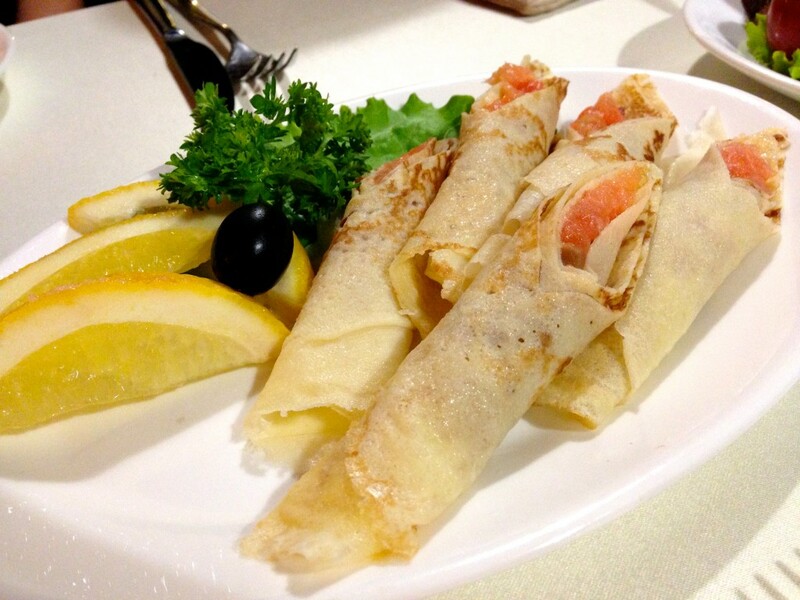 Classic Ukrainian thin pancakes (blini) can be ordered stuffed with cottage cheese, meat, or salmon on the savory side – and various jams, fruit and chocolate if you’d prefer your crepes for dessert. There is a large selection of salads (seafood, vegetarian, or traditional ones made with veal and/or mayonnaise), and countless meat options. 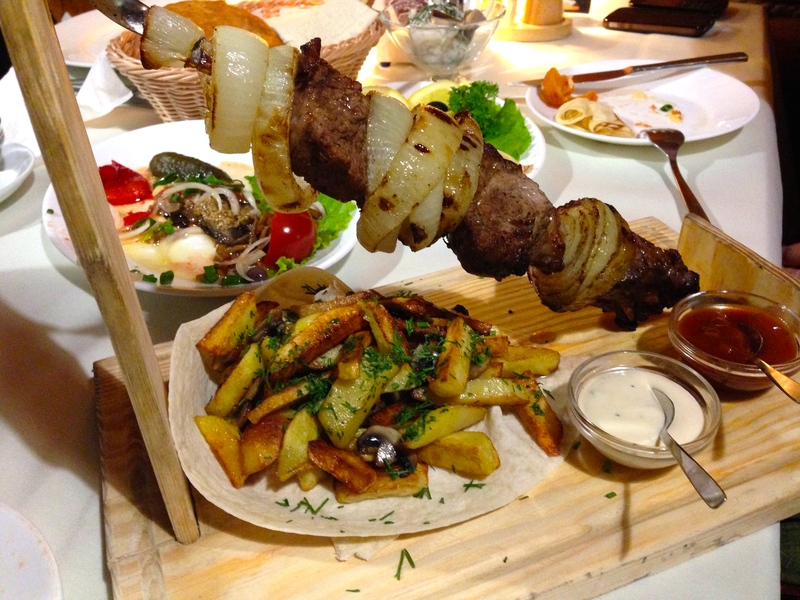 Do yourself a favor and order the pork shashlik, served with flair on some kind of propped up saber, laden with grilled onions and griddled potatoes. The “tobacco chicken” is touted as one of their specialties, and it was tender and well-seasoned… but it’s just a fancy name for smoked chicken with bar-b-que sauce. “Tobacco chicken” sounded carcinogenic and vaguely romantic; although it was delicious, it was neither of those things. Vareniki are as grandmotherly as can be, but the dough here is thick — so if you’re going to polish off an entire order by yourself, beware of a gut bomb. Fillings include cabbage, meat, potatoes, mushrooms, and cheese. The atmosphere is charmingly medieval, like you’re dining in a hut within a larger building, and there are displays of Ukrainian cornucopia and pottery and enough kitsch to service a Renaissance Faire. But the food checked all the boxes: yummy, plentiful, and cheap. Put on your flowery, painted scarf, tie it tightly under your chin, and dig in.